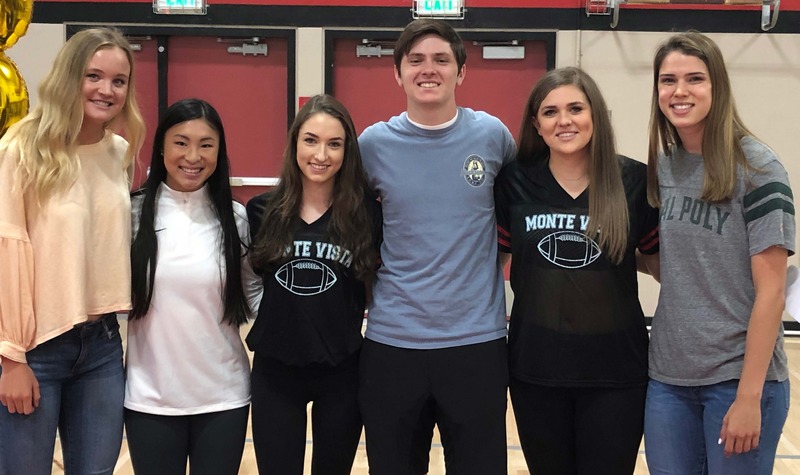 (Danville, CA) – The Monte Vista Athletic Boosters (“MVAB”) Scholarship-Award program recognizes and rewards Monte Vista High School student-athletes who demonstrate excellence through athletic participation, academic achievement, and service to Monte Vista High School and the community. Six $1,000 scholarships were awarded during the Senior Inspirational Awards Ceremony held at the school on May 23, 2018. The recipients are listed below. 2018 MVAB Scholarship-Award recipients, pictured (l to r): Makenna Turner, Faith Leung, Krista Henehan, Carson Bull, Julia Berg, and Nicole Cavote. Julia was a dual-sport athlete at Monte Vista, competing on the tennis and basketball teams. Her senior year Julia was tennis team captain and helped lead the Mustangs to their 4th consecutive NCS championship. During her years at Monte Vista she excelled in the classroom, served in student government as well as in the community. Known for her positive spirit and consistent work ethic, Julia gained much respect and admiration from her peers, teachers and coaches. Julia will be attending Indiana University in the Fall. Carson competed on the lacrosse team during his 4 years at Monte Vista, serving as team captain his senior year. He earned all-league honors his first 2 years on Varsity, along the way helping lead the Mustangs to an undefeated record and NCS Championship his sophomore year. Off the field he excelled in the classroom and also invested himself in the community through his involvement with the Oakland Lacrosse Club. Next year Carson will attend UCSB, where he plans to study computer science. During her three years on the volleyball team, Niki helped lead the Mustangs to three consecutive NCS titles, and was named EBAL MVP [and NCS Player of the Year] during her senior season. She also showed her versatility as a participant in track & field, where she was an NCS qualifier. Next Fall Niki will attend Cal Poly San Luis Obispo where she will play volleyball and pursue her career interest in sports management. Krista has been a member of the cheer team all four years at Monte Vista, earning varsity letters the last two years and served as team captain her sophomore year. She was twice recognized by the NCS as an Athletic Scholar. Off the fields and courts, Krista showed her passion for giving back by volunteering in numerous organizations (where she logged 285 hours of community service), for which she was recognized by receiving the Yellow Rose Bud Award. Next year Krista hopes to participate on the cheer team at University of Oregon, where she will pursue a degree in business administration. Faith played soccer all four years at Monte Vista, serving as team captain her junior year. As a member of the varsity team her senior season, helped lead the #1 nationally-ranked Mustangs to become NCS and CIF North Region Champions. Off the field she volunteered in several community organizations; and in the classroom Faith challenged herself with a rigorous academic schedule, receiving numerous academic honors including the NCS Athletic Scholar Award all four years. Next Fall Faith will attend Cal and plans to major in computer science. Makenna was a four-year varsity letter winner on the Monte Vista swim team, helping lead the Mustangs to back-to-back NCS championships the last two years, and the state title in 2017. She was also a 2-time individual NCS champion in the 100 yd butterfly. Makenna excelled outside the pool as well, receiving academic All-American honors. Next fall she will bring her talents to USC where she will be a member of the swim team and plans to major in communications, political science or film.